In the spirit of St. Patrick’s Day, we have put a bit of Guinness, whiskey, and Bailey’s Irish cream to good use in this recipe from Smitten Kitchen – Irish car bomb cupcakes. I had already gone through a four pack of the Guinness we had planned to use the first time we wanted to make these delicious cupcakes, so we decided to hurry up and make it, just in time for Boston’s favorite holiday, and to prevent me from finishing another four pack. These cupcakes are amazing. Christine likes them as long as the ganache filling isn’t too strong tasting. We had to improvise a bit because of some first time mistakes, but overall it turned out really well, and partygoers at a recent CW Taekwondo party seemed to agree. Heat up the butter and Guinness over medium heat. Add in chocolate powder and mix until thoroughly melted, and take off heat. Preheat oven to 350 degrees. Line cupcake tins with cupcake liners. Since it’s after Valentine’s Day, leftover heart-covered liners are great. 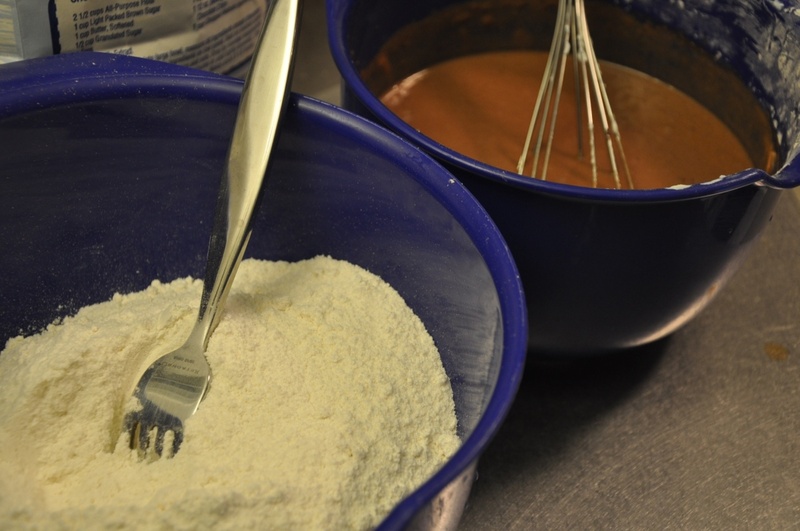 Mix the dry ingredients (flour, sugar, baking soda, and salt) in a bowl. Mix the wet ingredients (eggs, sour cream, and stout mixture) in another bowl and beat until blended. 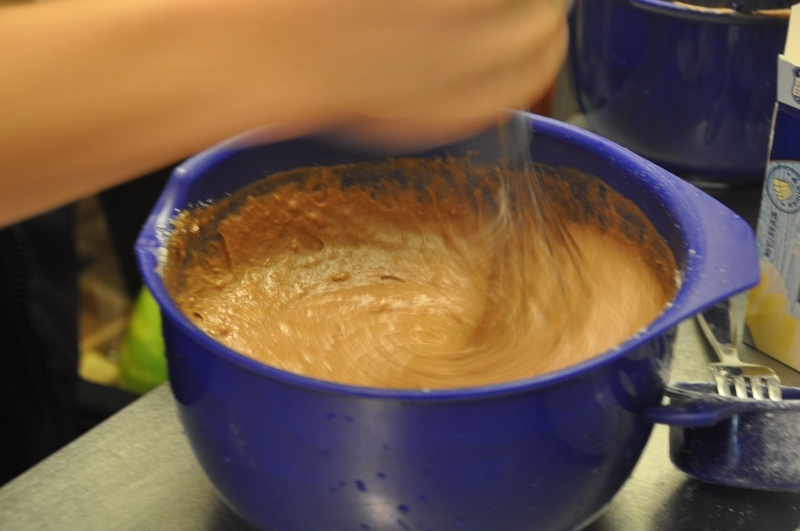 Add the dry ingredients and fold into the mixture until completely combined. Do this with a large rubber spatula and make sure that all the dry powder has mixed completely. Fill each cupcake liner about 2/3 full, and bake for about 17 minutes, until a chopstick or toothpick comes out clean when poked into the middle of a cupcake. Rotate tray half way through to ensure even heating. On medium heat mix the butter, vanilla, and milk in a sauce pan until the butter is completely melted. Keep stirring and do not let the milk burn. In a small bowl, mix the whiskey and cornstarch until the cornstarch is completely dissolved and the mixture is a thick and smooth liquid. Pour the mixture into the sauce pan, constantly stirring and flattening out lumps. Pour the sugar into the mixture and stir until everything is combined and thick, and pour into a bowl to cool. 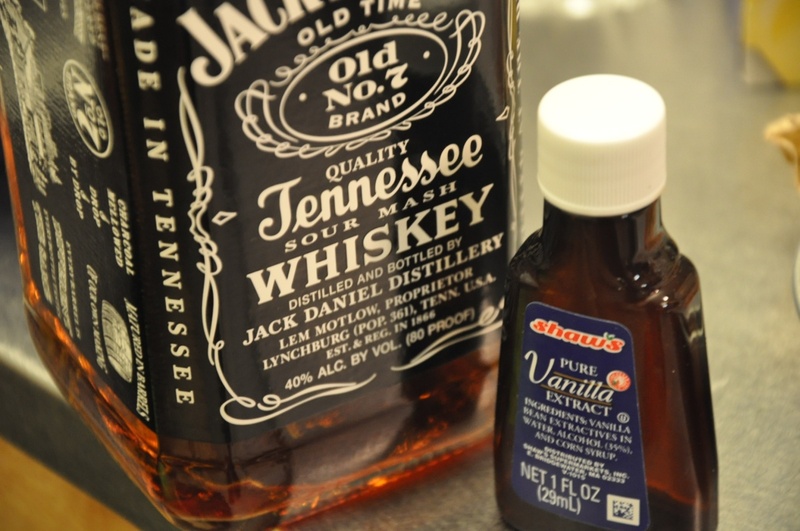 Note: to make the ganache less alcoholic tasting, use less whiskey or add more sugar. We didn’t quite follow the directions correctly but our frosting came out pretty well anyways. You should have the butter at room temperature and whip it until it is fluffy, then add confectioner’s sugar and keep whipping it until it is thick. We basically heated up cold butter in the microwave until it was basically melted, and added in granulated sugar and made it completely mixed. 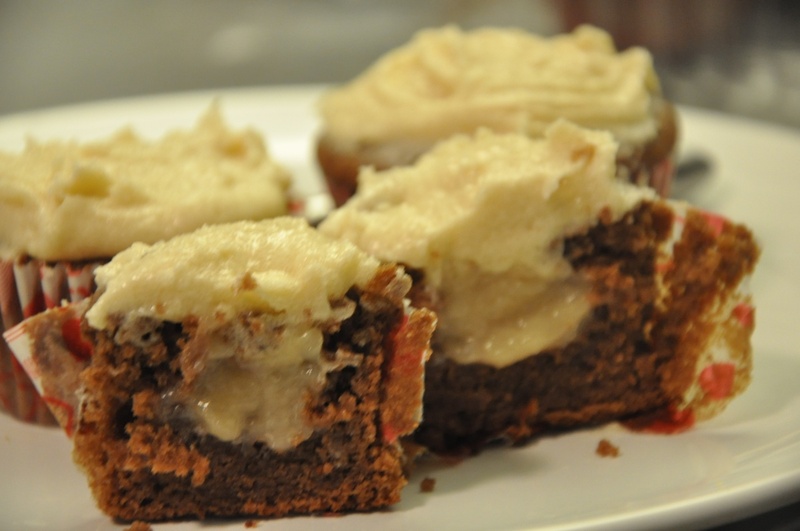 The sugar remains granular so the icing is kind of crunchy. 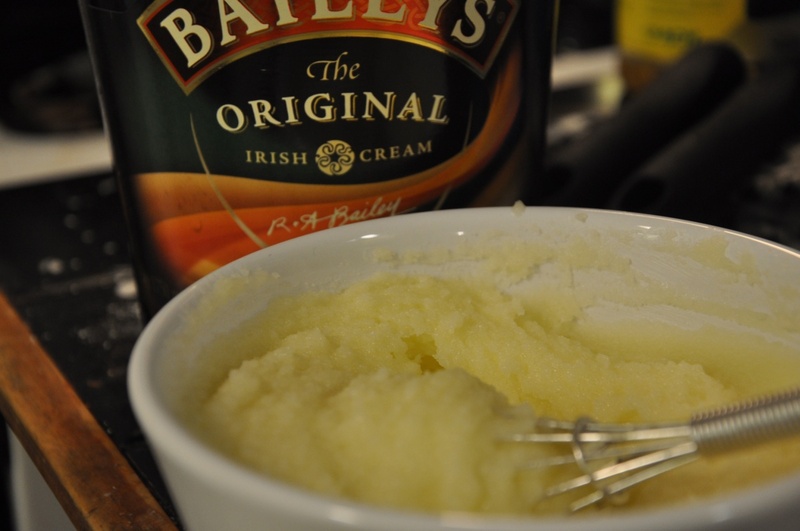 Then, add in one or two shots of Bailey’s and continue to mix. We took an empty water bottle, removed the cap, and used the opening to make holes in the cupcakes. 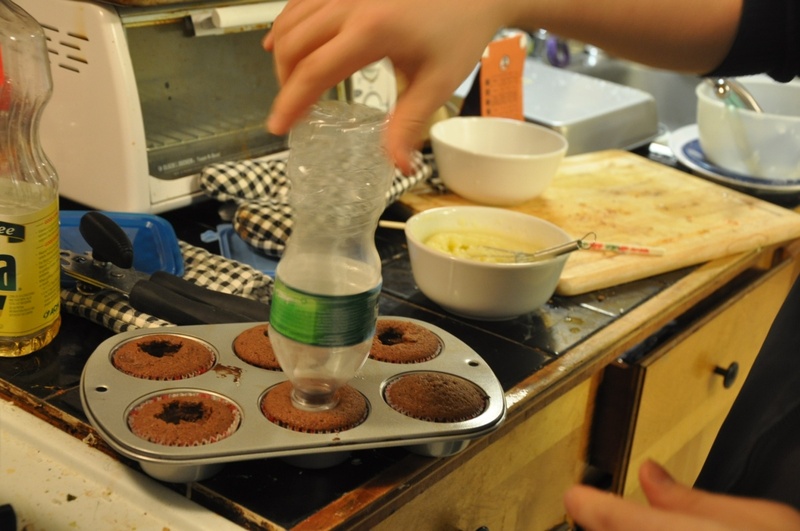 Slowly push down as you twist the bottle back and forth, and when it has gone into the cupcake past where the lid usually stops, pull it out. There will be a small plug of cupcake in the bottle, and a quick squeeze will cause it to fly out into willing and hungry mouths. To fill them with the ganache, spoon all the ganache into a plastic bag and seal it. Cut off the tip of a corner of the bag, and use the bag to squeeze small amounts of filling into the holes in the cupcakes. 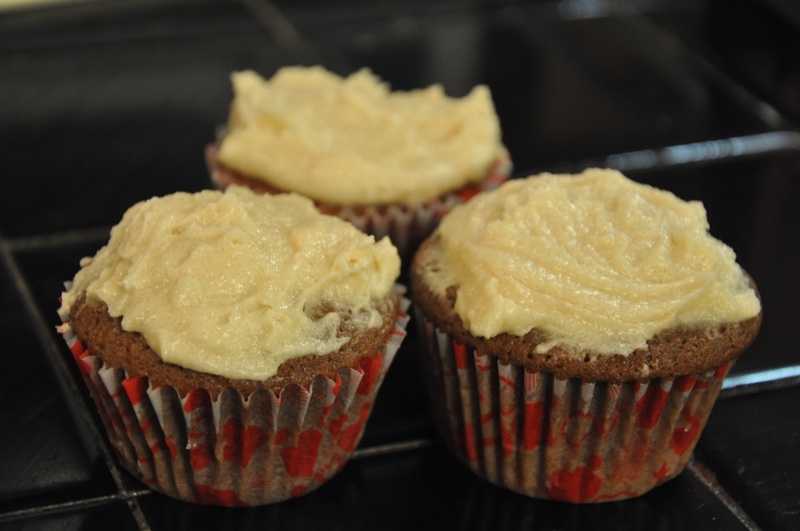 Put the frosting into another bag and use it similarly to put frosting on top of the cupcake. 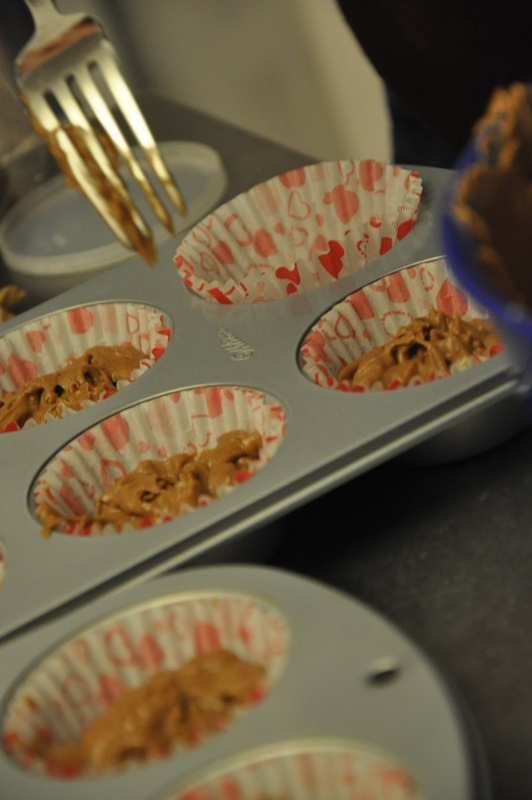 Then use a knife or spoon to spread the frosting around to cover the top of the cupcake. Makes 4 batches of 6 cupcakes plus two more. The frosting and ganache may run out early, so you will end up with some cupcakes with frosting and ganache, some cupcakes with only frosting, and some plain cupcakes, which will be good depending on how Irish your friends are. Ways to prolong procrastination: make a mushroom pizza (recipe to be written). 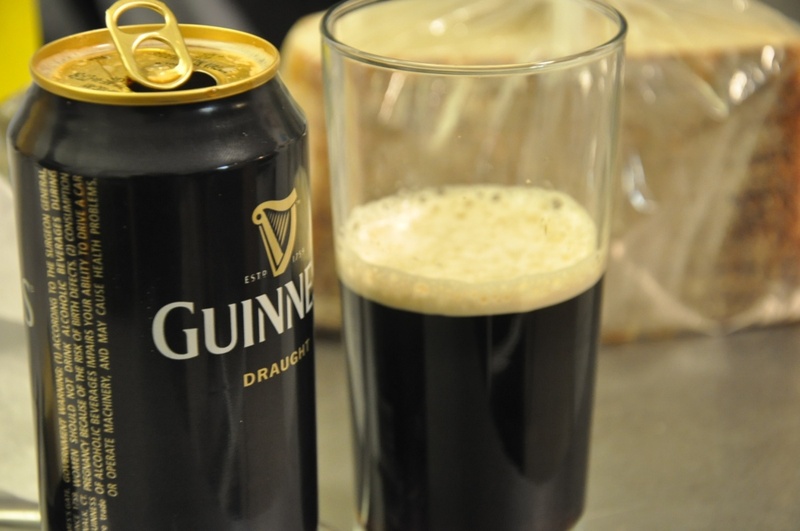 Drink the remaining Guinness (you will have about half of a beer left.) Have an actual Irish car bomb. This recipe has been a long time coming. 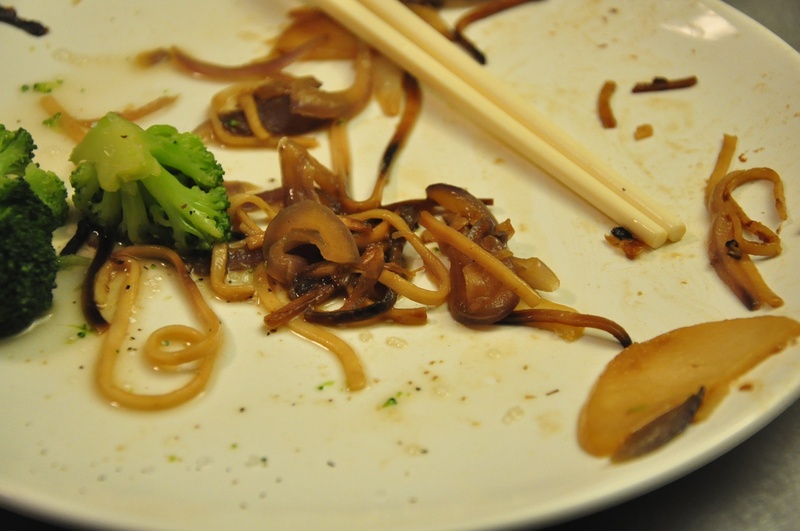 I first saw it the week before the West Point taekwondo tournament, when I had to drop five pounds and couldn’t eat anything besides the occasional salad. The week after that was hell week followed by hell weekend, during which I was too busy trying to learn two months work of immunology in a weekend to cook. Last night, finally, there was a smidgen of breathing (read: eating) room before Bobby starts cutting for nationals. For all intents and purposes, these are dumplings with mushroom filling. But these little dumplings have a gorgeous, flaky, golden crust that is to die for. And with the amount of butter and cream cheese in it, you may just die from heart disease. But let’s not think about that. They are savory and just crisp enough to give you a satisfying crunch and absolutely magical little morsels. In large microwaveable bowl, combine cream cheese and butter and microwave to melt. Beat together until fluffy. Stir in flour 1/4 cup at a time until dough begins to form. Knead in until smooth. Divide dough in half and flatten into 2 discs. Cover with saran wrap (Important! Else your dough will end up too dry like ours did…), then refrigerate until firm, at least 30 minutes. On lightly floured surface, roll out each disc into until they’re about 1/8 inch thick. They should be thicker than your average potsticker wrapper, but still thin enough to wrap. With a 2 1/2 inch round cookie cutter (we just used a cup), cut out circles, rerolling scraps. Our rolling pin is pretty kickass, no? In large saucepan, heat olive oil over medium heat. Fry the onion, garlic, thyme, oregano, dill, pepper and salt, stirring occasionally, until onion is softened, about 3 minutes. Increase heat to medium-high. Add the mushrooms and fry, stirring occasionally, until browned, about 10 minutes. Stir in the vegetable broth and cook until liquid is evaporated. Let cool to room temperature. Brush the edges of the circles lightly with egg. Place about 1 tsp of the filling in center of each, then fold dough over filling, pinching edges to seal. Try not to get the filling juices to touch the edges, because the liquid keeps them from sealing properly. Place the crescents 1 inch apart on an ungreased baking sheet. Brush tops with remaining egg. Bake in the center of 400F oven until light golden, 15 to 17 minutes. Makes about 40 crescents (so says the recipe, but we only got 22 out of it…). We had quite a bit of filling and egg left over, so Bobby decided to omlettize it. Epic fail, because there was more filling than egg, but we wrapped it up in fresh spinach leaves and ate them while waiting for the crescents to bake. Dee-licious, and pretty damn cute, too. I thought they resembled little animals floating down a river on little leaf boats (a la this), but I had to push that thought away quickly else I couldn’t eat it. Ways to prolong procrastination: Fight over which crescents to take pictures of and which crescents I’m allowed to eat. This entry is not really a recipe but just a note about how to make a bad snow day into a good breakfast. I biked through three inches of snowcover in the middle of the road this morning to find that the shuttle to work had already left. I was 1 minute late. You’d think that on a snowy day the shuttle would be late rather than early. But when I made the trek back, i decided to have granola and soy milk and a hard boiled egg for breakfast at home. The granola was from Next Dining, and at $1.60 for about a pound(? maybe 3/4 lb) it’s a really good deal. The soymilk was from a Starmarket but still good nonetheless. Here is how to make a hard boiled egg, in case you didn’t know. Really, it’s simple, except I couldn’t figure out whether the eggs were ready or not, so use this as a quick guideline. 2. Remove from heat and IMMEDIATELY place eggs under ice cold water or in a bowl of ICED water to chill promptly to help yolks stay bright yellow. Chill for a few minutes in the cold water until the egg is completely cooled. This is an extremely important step which prevents the greenish “ring” from forming on the surface of the yolk over time. If the egg is not chilled immediately after cooking an unsightly dark greenish ring will eventually appear on the outside of the yolk. Bring enough water to submerge all tomatoes to a boil. Put the tomatoes in for about 30 seconds, until the skin starts to wrinkle or split. Take the tomatoes out and peel off the skin, and any stems that are left. Cut the tomato into quarters, and using your fingers, remove the pulp inside along with the seeds, leaving only the flesh. Heat the olive oil in a skillet, then stir the tomatoes in the hot oil for about five minutes, until juices start to come out into the pan. Take the skillet off heat and transfer the cooked tomatoes into a blender. Blend at high speed until everything is smooth, and pour it back into the skillet. Add half of the garlic, the oregano, salt and pepper to taste, and simmer for 2 minutes. In a bowl, mix the cornstarch with equal parts water until it is completely dissolved, and add to the tomato puree. Add another cup of water and stir over medium heat for another 2 minutes. Add the two scoops of green tea ice cream to the pan and stir until completely melted. Pour the soup into a bowl, sprinkle the rest of the garlic and some dill weed to garnish, and serve nom. Makes one large bowl. * The green tea ice cream is the result of our lack of ingredients. Perhaps a cup of milk or half a cup of heavy cream would have been more appropriate. However, the green tea ice cream was the only source of dairy in my fridge, and in the end, it added a welcome sweetness that balanced out the tartness tomatoes. Arrange two slices of bread on a George Foreman grill. Alternatively, a spatula and a drop of olive oil on a hot skillet works just as well. Layer cheese thickly until slices are completely covered. Top with spinach and cover with the other slice of bread. Grill for three minutes or until you smell the toasty aroma. If using a skillet, flip the sandwiches halfway through. Dip in the tomato soup and enjoy! Makes two sandwiches. Ways to prolong procrastination: Complete a crossword while nomming.